Thank you for all the nice comments on my jacket-in-the-making! I think I should stop calling it the 'Tetris-jacket' because although cutting it out required a lot of Tetris-related skills, the end-result should have little or nothing to do with piled-up blocks... Suggestions for a new name are welcome! Many of you asked questions about sewing with leather. I'm by no means an expert but I have dabbled before and so I will try and answer your questions, as well as give some additional pointers. 1. There are many different kinds of leather, depending on the animal it comes from and the way it has been treated (e.g. suede is just 'brushed' leather...). Suitable leather for clothing is usually lambskin although goat, calf and pig are used as well. Cow skins are much thicker and usually used for upholstering furniture. It is often easier and much cheaper to find second hand leather garments which you can cut up and re-use. Not to mention that it's more environmentally and animal friendly... Apart from real motorcycle jackets, all leather used in clothes is of the kinds I mentioned as 'suitable for clothing' above. 2. You can sew 'clothing thickness' leathers on an ordinary sewing machine. For 'furniture thickness' leathers, you would need an industrial sewing machine. 3. You could sew leather using something like a denim needle, but I strongly recommend you get leather needles. And ordinary needle has a point and sort of pokes holes into the material. A leather needle has a knife-like tip which allows it to cut into the leather. This means it puts less stress on the leather and on your sewing machine. 4. Leather doesn't behave like fabric under your presser foot and, as a natural product it can be uneven in texture. It can 'stick' or stretch in places. How bad this is differs per piece of leather and per sewing machine. So, always try out on a scrap first. Using a teflon- or roller foot often helps. If nothing else will help, sandwich the leather between strips of tracing paper, stitch through all layers and tear away the paper afterwards. 5. Make sure you don't have to unpick anything and if it can't be avoided, sew you new seam next to the old one, further into the pattern piece. The holes of the seam are there to stay. 6. Use a narrow seam allowance. 1 cm is enough for a material that can't fray. And you can't alter to make it bigger by letting out the seam a bit anyway, see point 5. 7. There is obviously no grainline in a piece of leather. So, take your pattern pieces and 'play Tetris' to put them as close together as possible, making the most of your material. 8. Leather can't be ironed, so to make the seam allowances lie flat, use glue. Any glue which is claimed to work on leather will do, but try out on a scrap first. You don't want to use a glue which makes your seams hard. 9. Think about the pattern you use. 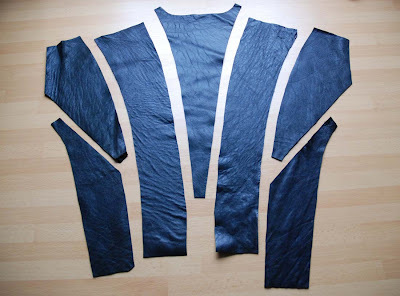 With leather, you could, for example, decide to have unfinished hems or to stitch some of the seams on the outside. However you should avoided crossing seams as much as possible. Seam allowances in leather stay very bulky in comparison to those in fabric. I hope I've covered all of the subjects which raised questions. 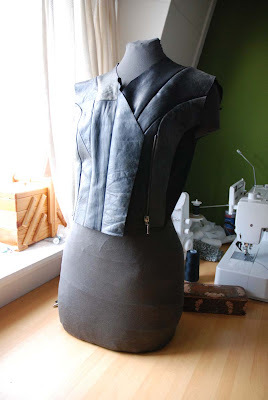 If there is anything else you want to know about sewing with leather, just leave a comment. This is just a very quick post. As I told you before, miss R came over yesterday to pick up her suit... Well, here she is wearing it! It was a very hastily taken photograph in which she was making a weird face and the trousers seem uneven because I've pinned up the hem on one leg but I hope it shows something. Anyway, there were some small thing which I thought could have been better but she didn't notice them even when mentioned. She looked great in the suit and was very happy with it. P.S. In response to several comments, I will put together some answers and explanations about sewing with leather later this week. Here's Mary showing my progress so far. Next order of business: that collar. Or the sleeves. And then the lining. Today, I'm once more making something from re-purposed leather (just like the short-sleeved jacket in the banner). And I'm not using just any old piece of leather clothing this time, oh no. Last year, my boyfriend finally decided to throw out his old leather coat. It was really necessary, the top layer of the leather had been completely worn down in some places and little bits of the surface of the pockets had been torn. However, it was also the coat he had been wearing all the time when we started dating (almost 8 years ago now). And every winter since. So, because I had already found out about the advantages of re-using old leather garments, I claimed it. Apart from the wear, this coat had another major disadvantage: it was made up from quite a lot of pieces and the front was full of pockets and closure-construction. As a result, that big coat didn't yield a lot raw material for me to work with. The leather from the coat sat in my stash for quite some time. I wanted to make something good from it. Something I would wear. A lot. A while ago, I finally made some sketches which came close. A short jacket, with armhole princess seams, long sleeves and a big collar. The real thing will have a zipper in the left princess seam. 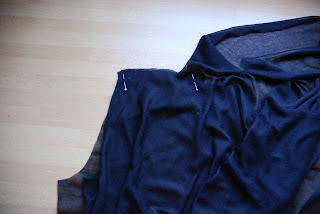 I will also use some black wool from my stash for the sides at the back, the sleeves and part of the collar. This top started out as this 80's monstrosity, bought for 1 euro at second hand stall at the market. Not the roughly cut-off sleeves which I serged before washing the shirt. There were large breast pockets and there was a notable difference in colour between the fabric inside and outside of them. As a result, this shirt was a poor candidate indeed for any kind of normal resizing or refashion. Until I realised I could try and enlist Mary's help. I started out, as I've shown before, by cutting the sleeves off and the sideseams open. Then, I put the shirt on Mary back-to-front and started laying the new front into pleats trying to achieve a pleasing shape. At that point, I wrote the earlier post about it. Then, I had to iron the shirt and re-do the pleats. The real challenge was creating a back and sleeves to match. I don't think the back really matches the front (which is in fact a bit of a pet peeve of mine) but I wanted to keep the collar and I didn't have that much fabric to play around with. The old top front of the shirt is now the back yoke and the rest of the back is made up from the fabric of the old sleeves. Darted and with an invisible zipper in the center back seam. The sleeves were draped for what was left of the old front (minus those pockets). I actually only draped the sleeve head and the added the rest free hand. I think I did well for a first try. There should have been a bit more ease in the sleeve head (I had to ease the arm scye into sleeve a little bit...) and usually, my sleeve hems hang more straight, but it does look like a sleeve. One of the big challenges of making this top came when I had to go from pinning and bits of hand basting on the dummy to actual construction. Suddenly, I had to determine where put the side seams exactly. And whether or not I had actually added sufficient ease for wearing... I made the body first, stitched it together and then I put it back on Mary to make the sleeves. I think that was the right order, knowing where the side seams are is quite practical when draping a sleeve. When all was done, I couldn't find a zipper in the right colour. So today, I decided to break with my usual habit and buy an overpriced one at the fabric store. Now, my top is finally finished. It's nice to wear because the fabric is ever-so-soft. The pleats are quite a bit lower and less straight then I originally envisioned them. I had pulled them taut on Mary, so I think it has to do with the added ease. Unavoidable really. There is a bit of a grainline issue with the back yoke. Which is, of course, terribly off grain and it sometimes shows. The worst thing is the fact that the whole garment twists a bit. The tight gathers on the hip somehow pull the side seam a bit to the front. I think that is caused by two things: the sheer weight of that pleated section and the weird grainlines at the side seams which are a result of all that pleating. 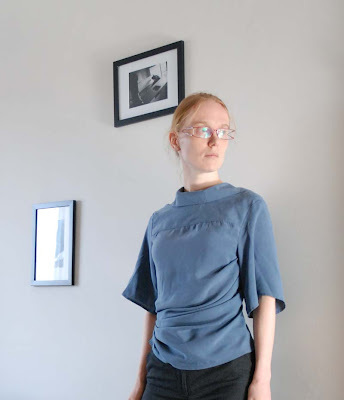 This is another of my tutorials for knits, for which you need to use an existing fitted t-shirt pattern as a base. I think most people will have one or more of those in pattern stash, and if you don't, you can always go and get Burdastyle's Lydia. I'm using my knit sloper, which has more waist shaping than Lydia. As ever, I recommend using a tried and tested pattern as a start for alteration. 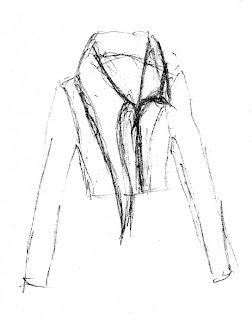 Unlike most other cowl neck designs, mine has a standing collar at the back which adds even more drape to the front. And a center front seam. The whole design is basically made to maximize drape in the chest area and works best is drapey knits. Making the pattern is fairly straight-forward. My picture shows a pattern without seam allowance. 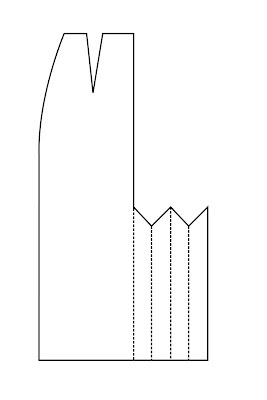 The black lines show the original front pattern piece. Before you start, you have to determine how deep you want the drape to be (mine is quite deep, I have to wear a tank top underneath). I usually do this by holding the tape measure around my neck, but it's a bit of guesswork anyway. You also have to decide on how high you want the back collar (which will not be interfaced, so it's not going to stand up that much). I will give you the measurements of my version later. 1. 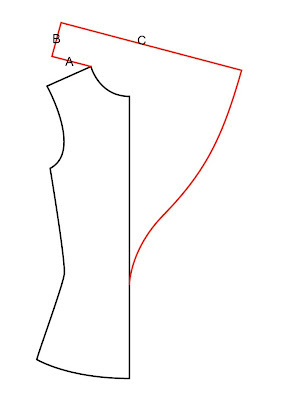 Measure the back neckline of the existing pattern. 2. 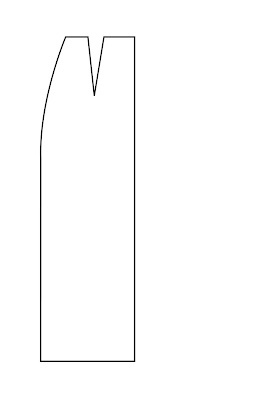 Draw a line of that length, starting at the point where the front neckline meets the shoulder. (line A) It should be at a bit of an angle, as shown. 5. The lower curve has to start at a 90 degree angle to line C and meets the original center front line at waist level (any lower and you loose the waist shape in the finished top, higher is possible, but then the drape should be smaller in circumference as well). The curve will give extra drape. Make sure you mark the point where line A meets the front shoulder, which will be 'encased' in the seam allowances. You will need to know where the point itself is, when you sew the top. 2. Pin and sew the shoulder seams, making sure to finish sewing at the marked point. 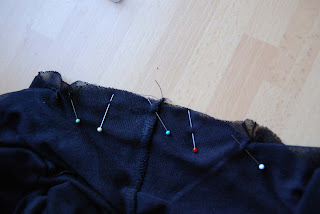 If you are using a serger, do this step and the next on the sewing machine first. 3. Clip the seam allowance on the front pattern piece to the marked point. 4. Sew the collar to the back neckline. When this is done, you can serge along the seams you've just made. 5. 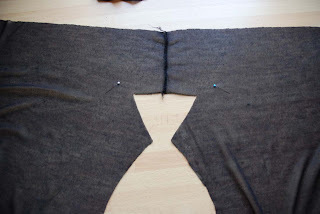 Sew the center front seam. 6. Set in the sleeves. 7. Sew the side seams and sleeve seams in one go. As ever, if you make a top using these instructions, please leave a link in the comments. I'd love to see it! I really wanted to make the drape-neck top tutorial today. Really. But it's too dark to take pictures now. 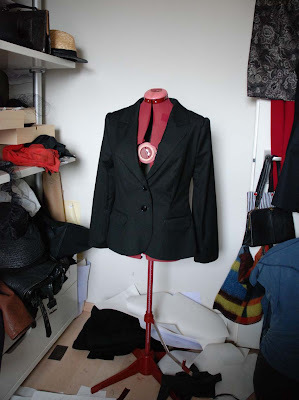 And today was the only day I had this week to work on this: miss R's suit. The jacket doesn't look good on the dummy but that's because R's bust height is quite different from the dummy's. It's a long story. 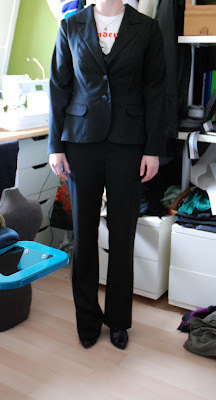 Over a year ago, I asked my friend, miss R, if she would let me make her a suit. As her figure is radically different from mine, I thought it would be a fun challenge. And I had the sneaking suspicion I might be able to make her look better than she does in RTW clothes. It was the start of a very long journey. All of this not at all helped by the fact that R is a very busy lady. Who was working hard to get into shape at the same time. And succeeding. Eventually, we went fabric shopping in May (dress was postponed indefinately at this stage). Fabric bought (she bought it, let's be clear about that), I sewed up the suit as far as I could without doing anything irreversable. (so: no pockets, no waistband on the trousers etc.). Then, I waited until she could come over for a final fitting. At which I found out I had to take everything in even more. By then, I had almost lost faith in the entire project. So it was a good thing she 'reminded' me of it a little over a week ago: I just had to get this done. Today was the final push. Almost. I still need black grommets and a ribbon for the back of the waistcoat. And we'll pin the hem on the trousers when she puts them on with her 'work shoes'. Oh, and I will make that tutorial on Saturday. Mary still doesn't have a foot. I haven't had much opportunity to hunt one down and, unfortunately, using the foot of my regular dummy is not an option. To stay in place, it uses a mechanism that's inside the dummy, not on the foot. Mary is stuffed with newspaper and has a cardboard bottom. She will need a foot she can just stand on. 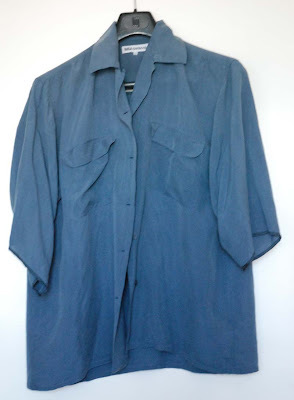 I'm playing around with a big silk shirt which proved to be a rather unwilling candidate for refashion so far. Mostly because of its two breast pockets which rendered to front of the shirt pretty much useless. After taking this picture, I've taken the shirt off and ironed it. Then, I put it back on Mary, this time making sure that it was on straight. I very carefully pinned the pleats, making them neater. I plan on basting them next. After that, I'll make the back. There is a plan for it. In the picture, I've been playing around with white tape and a bit of Mary-fabric to try and determine a proper line for the armhole. It seems tempting to keep the shoulder width and call it a cap sleeve, but, unlike Mary, I need to be able to move my arms forward. I'm still contemplating sleeve options. I won't have a lot of of material left for it, so it will have to be a short sleeve at most. Any suggestions? by Creative Mama in her comment to my latest post. She wants to know how to draft that pleat I used for my skirt because, wait for it... She wants to get back to wearing skirts! Now, I need to make one thing clear: I don't grant all requests. Not because I'm nastly but mainly because, in many cases, it's not as simple as it seems. That's why I do tutorials for jersey tops, but not for trousers. However, this is a very simple request to grant AND for a good cause. Dear Creative Mama, if you've done any pattern drafting yourself, you probably have a skirt sloper (when I learnt pattern making, everyone had to start with that, even if you not planning on ever making a skirt). If you don't, you can use any normal pattern for a straight skirt. I' going to give the instructions for a pattern without seam allowance. If it has added width for a back vent, remove it. Make sure the pattern is at the length you want. Determine how deep you want your pleat to be. In the finished product there will be two double pleats on top of each other, behind the center back seam. So the added room for movement will be pleat depth times eight. My pleats are 5 cm deep. The dotted lines will be the fold lines. There's 5 cm between each of those in my pattern. 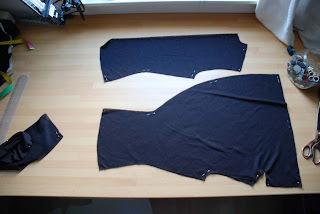 When you are sewing the skirt, simply start by sewing the center back seams of pleat and skirt above the pleat. Then, press the pleats, matching the diagonal lines at the top. Stitch the tops together, ending at the center back seam. 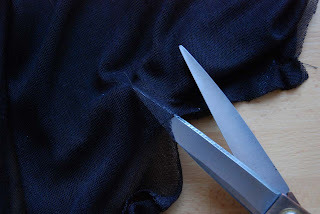 To save fabric or to use a contrasting colour in the pleat, you can also cut the pleat section seperately. In that case, just take care to keep the seam, joining it to the skirt, out of sight. It is important to pick a fabric which can be pressed well or you could (which I don't like, but it is an option) narrowly topstitch each pleated edge to keep it in shape. I promised their would be colour to my autumn sewing, didn't I? This skirt has been finished for over a week but I really wanted to be able to show it off the way I had imagined it. Without resorting to black or grey wardrobe staples. The mustard coloured wool isn't from stash, I bought that recently. I really wanted a colour like it for my autumn/winter colour scheme, so, when I stumbled across this stuff when shopping for zippers, I couldn't resist. And because there was 'only' 4.5 meter left on the roll, the seller offered me a serious discount if I would just take the lot. Which means I will have to make more clothes in this colour. I'm thinking about a matching jacket, either nipped-waisted and New Look-alike or early 60's style block-y, and maybe a mod dress and/or a full skirt of some kind. This is a very simple pencil skirt with a double box pleat at the back (my own pattern). And yes, it fits properly, I just pull it weirdly by trying some 'fun' posing... It is lined. The shirt uses up all the fabric I had left over from making this dress, a viscose/rayon. 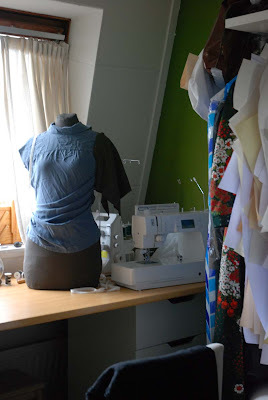 I had drafted a different blouse, which used way to much fabric. Then, I made this, which is in fact a very quick and easy adeption of my basic sloper. I love how it turned out. I sewed the lower ends of the darts so the blouse would fit smoothly when tucked in but just look at the shape that creates! I may just have to make a dress based on this pattern... I think it would even work with a longer sleeve. So far, I've mostly sewn button-down blouses but now, I've really developed a taste for vintage-style ones with side or back closures. There may be more. And most of all, I'm happy with these colours. I, used to wearing black and muted colours as I am, would wear this in real life. Everything in colour but the stockings. And both pieces would combine really well with black, grey, brown and olive as well. The colour scheme is here to stay!